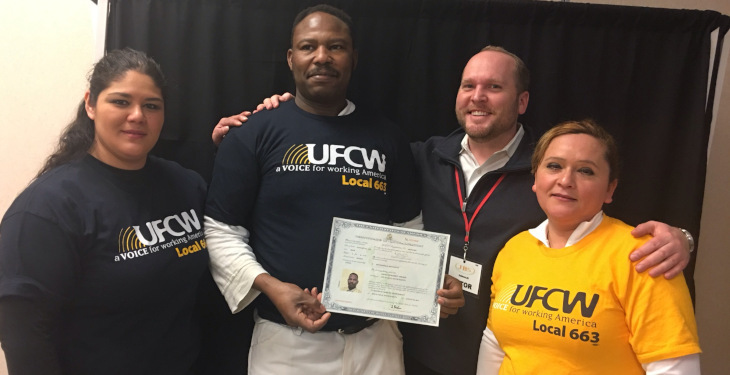 On January 24 and 25, UFCW Local 663 members attended Union Citizenship Action Network (UCAN) workshops in Worthington, MN. The workshops focused on legal services, the process to become a citizen, and other immigration and citizenship issues. Over 50 people attended. 14 members received assistance filling out their naturalization applications. This is the beginning of the path to becoming U.S. citizens. Local 663, in cooperation with JBS pork plant, held the workshops at the worksite. 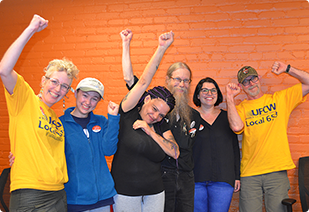 UFCW Local 663’s workshop partners included Immigrant Law Center of Minnesota and UFCW International. Both councils provided legal assistance to members to answer questions about the naturalization process. Local 663 knows firsthand that we are stronger together. When we are together, we have more resources to break barriers that hold us back from a better life. That’s why we merged Local 653 and 1161 last year and why we continue to build lasting community partnerships. That’s also why Local 663 is a proud member of the UFCW United Latinos. UFCW’s United Latinos offers scholarships through its New American Citizenship Fund. The scholarship is for UFCW members who have applied for U.S. citizenship and who have demonstrated a strong commitment to building a stronger voice for workers in their Union and in their community through active engagement in advancing social and economic justice. The United Latinos of the UFCW has created a special fund that will distribute scholarships in the amount of $600.00 per member. Quarterly UCAN workshops will continue with Local 663 membership in Worthington, MN throughout the year. These workshops weave deeply into Local 663’s commitment to growing our union family through focusing on the worth of what it means to be a union member. Local 663 Educational Grants Applications Now Available! Our Minnesota Nurses Association Needs your Support!